Although the French Open was established in 1891, it was only in 1897 that women were allowed to compete. In the early days, however, participation was restricted to French nationals and foreigners who were members of any authorized French Tennis Clubs only. Unlike other Grand Slams, the French Open always featured a best-of-three sets clash with regard to Women's Singles. The winner of the Women's Singles final takes home a replica of the Suzanne Lenglen Cup named in honour of the 6-time French Open Champion. Chris Evert has won the most French Open titles among Women in the Open Era with 7. The record for most consecutive titles won at Roland Garros in the Open Era is shared by Monica Seles and Justine Henin - both with 3 consecutive wins. 6 women have won the French Open without dropping a set. The last person to accomplish this was Belgian Justine Henin back in 2007. France leads the countries in the all-time tally with 30 French Open titles closely followed by the USA with 29 titles. Australian Evonne Goolagong Cawley was one of the leading women tennis athletes of the 1970's and early 1980's. 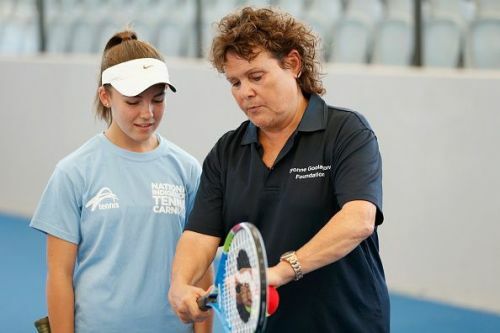 After the retirement of compatriot Margaret Court, Evonne Goolagong took over the baton of leading Australian Women's tennis. Goolagong Cawley won 14 Grand Slam titles: seven in singles (four at the Australian Open, two at Wimbledon and one at the French Open), six in women's doubles, and one in mixed doubles. Along with Margaret Court, she is the only woman to have won Grand Slams in multiple categories after childbirth. Goolagong Cawley won her only French Open title in 1971 aged 19 years, 309 days.